(Model year changes for the 1962 full-size Fords went beyond fresh sheet metal, dimensional differences, and mechanical tweaks. One of the several notable changes was the elimination of the Starliner, and with its departure, the sleek roofline. All closed non-wagon models had the T-Bird inspired “box top” roof which soon created a problem for those who were racing Fords on the super-speedways. An unusual solution to the drag-inducing boxy roofline was developed for the racecar drivers, but it lasted for only a very brief time during the model year and resulted in what is said to be the only officially “illegal car” to win a Grand National event. The Starlift top was a detachable fiberglass roof for the Sunliner, the name for the convertible model. The roof was shaped basically the same as that of the steel-topped Starliner of the preceding two model years. It really was not seriously intended for typical owners of the Sunliner, but in order to qualify for use in NASCAR competition it had to be available to the general public. The idea behind it was simple – aerodynamics. Air flow over the boxy Galaxies became turbulent on the super-speedways where the speed was higher, thus top speed was reduced. To solve the problem, Ford created the Starlift as an option for the Sunliner. It worked well for those who were racing Galaxies, but it was not a great item for the general public as the rear side windows did not fill the opening and there was evidently no filler panel included with the top. NASCAR officials allowed it for just one race then banned it. Ford had a special brochure printed detailing the option and reportedly showrooms of dealerships near major racetracks had Starlift equipped Galaxies. Whether or not any were actually sold to customers is unknown as is whether or not any survived, though some years ago one Sunliner was rumored to exist with the Starlift top. The year 1962 was not a good one for Ford’s factory-back racing activities. In addition to the engine failures encountered during the early part of the race season, formal roofed Pontiacs were getting 465 hp from their 421 and setting record speeds. Plymouths were downsized and powered with the 413. 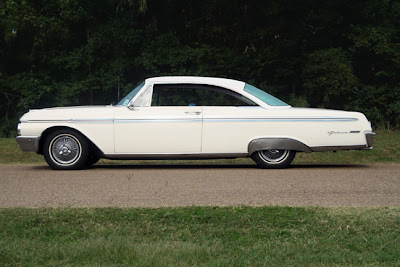 Chevrolet grafted the 1961 bubble top roof to the Bel Air for 1962 and ran with the 409. The additional horsepower provided by the new 406 was not enough to overcome the drag of the T-Bird roofline. 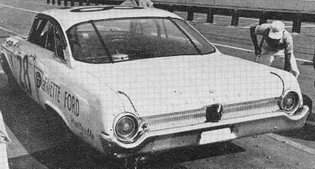 Ford estimated a three mile-per-hour loss in top speed with the box-top Galaxies being raced by Holman & Moody drivers Fred Lorenzen and Nelson Stacy and by Wood Brothers’ driver Marvin Panch as well as independent Larry Frank. 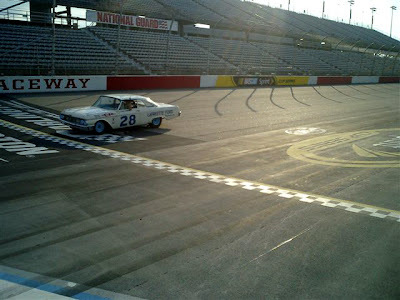 The 385hp version of the 406 powered the '62 NASCAR Fords. This replica has a 390 rebuilt to 406 specs. The next event scheduled was the World 600. This plan could not be executed, however, because the required 45-day period between the announcement of a new component such as the Starlift and the race had not been met. Instead, Lorenzen and Stacy ran with sedans built for the USAC dirt track; Stacy won and Lorenzen finished third. The sedans were sent back to the USAC circuit and the convertibles with their Starlift tops in place were rushed to the Atlanta 500. Then Friel declared them illegal until convertible-type X-members which had been removed from the frames were put back in place. The ruling was complicated by the fact that no other “bolt-together” automobile had been run on the Grand National circuit in the past. Without such a precedent in place, the ruling became “hazy” as expressed by the writer for Motor Trend. In Friel’s judgment, the convertibles raced at Darlington were permissible without X-members, but as sedans they had to have them. So the X-members were welded back in place. Then Friel consulted NASCAR’s Bill France about the issue. A decision was made the day before the race. The cars would be allowed to run in the Atlanta 500 race, but until NASCAR was satisfied that the bolt-on tops were “sufficiently available” and proper notice was given of a “new model” Ford, they would be ineligible for future races. Perhaps the rule-makers would have taken the Starlift top more seriously as an option if the quarter windows of the convertible actually filled the opening. 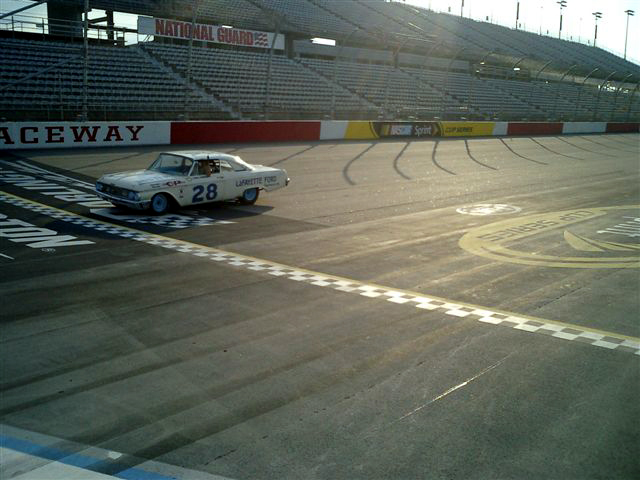 The Starlift was not used again in NASCAR, but it helped to give Fred Lorenzen a victory in the sole race in which it was allowed. Without quarter windows or filler plates to fit the large opening left by the arcing C-pillar, virtually no one would have wanted the top for their personal car. Those running in the Atlanta 500 had the openings filled with plastic side windows. Obviously the top was really intended for racing purposes rather than as an option for regular Sunliners. Even if the roof had been allowed beyond the one race it would have been for the remainder of the 1962 race season only as this was the final year in which convertibles would be raced. The car was built/restored by Tom Kitchen of Florida and is the only “tribute” car of this model out there and it is street legal! 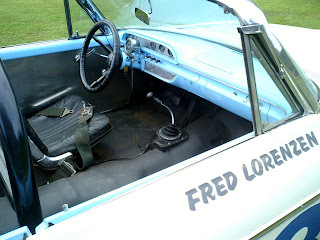 The interior very closely resembles the design used in NASCAR stock cars of the era. After building numerous NASCAR “golden era” clones, Tom pondered what could top his last build, a 1957 Ford Grand National Fireball Roberts NASCARReplica? The car got plenty of press around the world for its attention to detail. 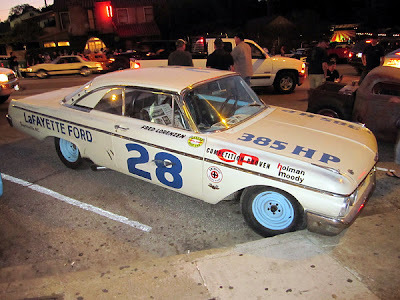 Tom finally decided to build the infamous 1962 Ford Holman & Moody team Galaxie “Starlift.” Tom took a 1962 Galaxie 500 convertible, installed a rollbar, aluminum interior, racing seat belts, and Stewart Warner gauges. As for the top, there are few if any survivors of the fiberglass tops used on the real Starlift, so Tom found a junked ‘61 Starliner, cut its top off and installed it on his replica. 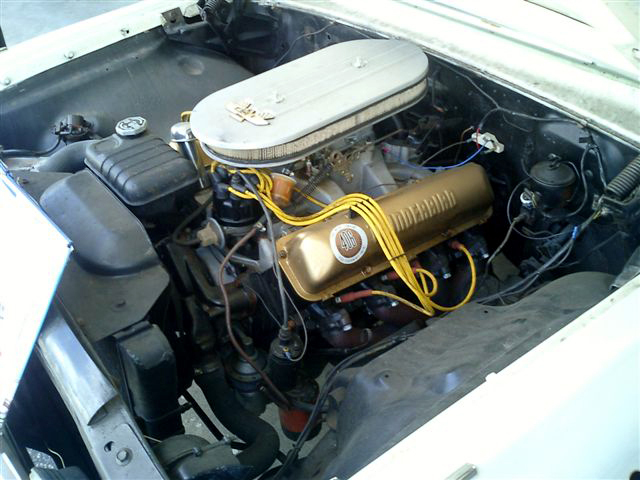 Under the hood, Tom had a Ford 390 bored out to the specifications of a 406, installed a 427 cam, and tweaked the car’s four-speed transmission. This Starlift replica made its Texas debut at the Lone Star Roundup in Austin, Texas earlier this year. Note the simulated "wheel rubs" on the side of the car. "Tradin' Paint" goes way back! On the outside, Tom had the proper lettering painted in place, covered the front lights, placed exhaust ports on the side, and even created “wheel rubs” on the side. The final result was a car that fools nearly 99 percent of the Ford folks who think it is a real ex-NASCAR racer. Although that was not his intent, it shows his attention to detail. Tom took the car to “Historic Darlington 2010” and while it did not compete in class racing, Tom did open it up on track making numerous laps at well over 100mph. Texan, Derik Lattig, bought the car and took the fuel cell out and had a gas tankinstalled so it could be driven to rallies and to car shows. Lattig also had glass packs installed as Tom sold the car “NASCAR ready” and it was loud. (The glass packs can easily be unhooked for that true NASCAR sound.) Additionally, Lattig had a prop maker for the movie “Star Wars” recreate the pushbutton, toggle switch starter control panel used by NASCAR at the time. To make his Starlift street legal, lights were installed on the inside of the grill. Special thanks go to Derik Lattig for his contributions to this story.